On November 4, 1995, Israel’s Prime Minister and Defense Minister, Yitzhak Rabin, attended a peace rally in support of the Oslo Accords at the Kings of Israel Square in Tel Aviv. Looking out on the crowd of more than 100,000, Rabin said, “I always believed that most of the people want peace and are ready to take a risk for it.” He was in a festive mood and even joined in the singing of “Shir LaShalom” (“Song for Peace”). The rally ended at 9:30 p.m. As Rabin walked down the city hall steps toward the open door of his car, Yigal Amir fired three shots at Rabin’s back with a Beretta 84F .380 ACP caliber semi-automatic pistol. The third shot missed Rabin and slightly wounded security guard Yoram Rubin. Amir was immediately subdued by Rabin's bodyguards and arrested with the murder weapon. Rabin was rushed to nearby Ichilov Hospital where he died on the operating table from blood loss and a punctured lung. He was 73-years old. In Rabin's pocket was a blood-stained sheet of paper with the lyrics to “Shir LaShalom,” which refer to the impossibility of bringing a dead person back to life and the need for peace. As Amir was being taken away in a police car, he not only admitted to killing Rabin, he bragged about it. “I think Yigal Amir, at that moment in the car, already believes that he was the instrument of God, that he was doing what God intended,” journalist Dan Ephron noted. “And he believes that because he did something that really defied the odds. He managed to get close enough to Rabin to shoot him. He doesn't know yet that Rabin is dead, but he knows that he managed to get close enough to shoot him.” Amir believed that he survived because he had done God’s will and God had protected him. This was the first assassination of a prime minister in Israel’s history and that fact, combined with the news that the killer was an Israeli Jew, shocked the nation. 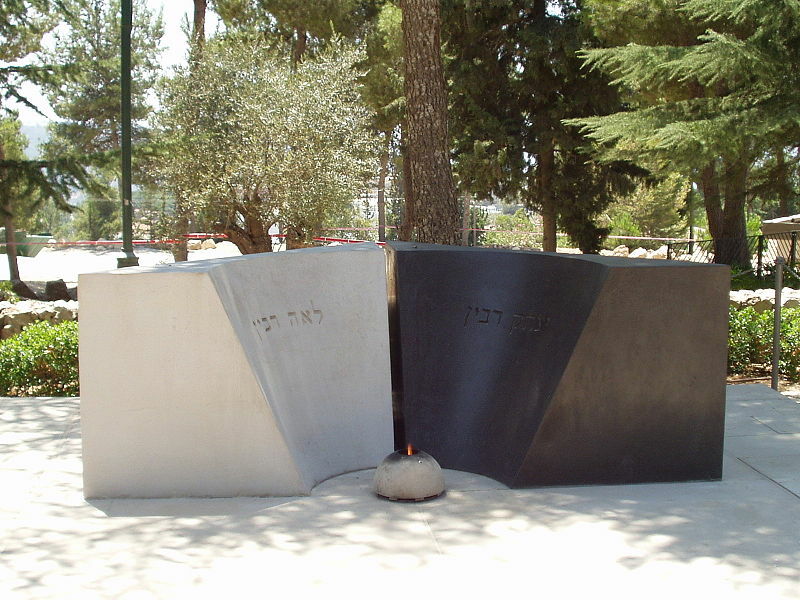 The funeral of Rabin took place on November 6, the day after the assassination, at the Mount Herzl cemetery in Jerusalem. Hundreds of world leaders attended the funeral, and several gave memorable eulogies, including U.S. President Bill Clinton, Egyptian President Hosni Mubarak and Jordan’s King Hussein. Many Israelis, particularly on the left, blamed the killing on the political climate in the country that had become radicalized by opposition to the peace agreement Rabin signed with Yasser Arafat. While there were many reasons to question the terms and wisdom of the Oslo agreements, the debate became highly personal and inflammatory with Rabin, a former chief of staff of the IDF and respected military leader, being accused of endangering Israel’s security. Opponents of territorial compromise from the Likud and other right-wing parties were vociferous in their condemnation of the Labor Party leader. Some religious leaders believed that withdrawal from Jewish land was heretical. The opposition to making a deal with Arafat, a man vilified for decades as a terrorist, grew as terrorist attacks escalated. The depth of hostility was apparent at rallies organized to oppose the Oslo agreements where protestors chanted “We’ll get rid of Rabin with blood and fire” and carried posters of Rabin dressed in a Nazi SS uniform and being the target in the cross-hairs of a sniper. Rabin and other Labor Party officials accused Likud leader Benjamin Netanyahu of provoking violence by his rhetoric at and failure to denounce the extremists at rallies he attended. Netanyahu denied having any role in stirring up the masses against Rabin. It is hard to gauge how this climate effected the killer. Yigal Amir was the son of ultra-Orthodox Yemeni immigrants. He was not a settler, but a religiously observant 25-year-old law student at Bar-Ilan University who opposed Rabin’s peace initiative and believed Israel’s withdrawal from the West Bank would deny Jews their “biblical heritage” and endanger Jewish lives. The advocates of the Oslo agreement believed that making peace with the Palestinians would preserve Jewish lives; however, three extremist rabbis from the West Bank wrote an opinion suggesting Rabin could be killed because he had betrayed the Jewish people. Amir similarly misinterpreted Jewish law and believed it was permissible to kill Rabin to protect the Jewish people. The site where Yitzhak Rabin was shot. Apparently, Amir had gotten the idea for assassinating the prime minister when he saw Rabin at the wedding of a friend in Tel Aviv. He was surprised by the lax security that allowed him to get close to the prime minister even though he was armed with a pistol. Amir only discussed his plans with his brother, Hagai, and a friend, but spoke openly about killing Rabin. Amir was on the radar of the Shin Bet because of his radical views. The security service was not aware of his feelings about Rabin, but was concerned with Amir’s efforts to create an anti-Arab militia. Amir was tried and convicted of murdering Rabin in March 1996. Since Israel does not have the death penalty, he was sentenced to life in prison and an additional six years for injuring Rubin. Amir’s brother Hagai was convicted for conspiracy to murder Yitzhak Rabin and planning attacks against Palestinians, as well as for various weapons charges. He was subsequently convicted in 2006 for threatening to have then-Israeli Prime Minister Ariel Sharon killed and additional time was added to his sentence. He was released from Ayalon Prison in Ramla on May 4, 2012, after serving 16 years. According to Ephron, there seems to be no lingering hostility toward Hagai, who has lived a quiet, normal life since his release. On March 28, 1996, the Shamgar Commission issued its final report into the assassination. It was critical of the Shin Bet for putting the Prime Minister at risk and ignoring threats to his life from Jewish extremists. Security was surprisingly lax as the area around Rabin’s car was supposed to be sealed off, but Amir and others could get inside the perimeter and close to the prime minister. Journalist Dan Ephron said that Rabin also was somewhat cavalier about his personal security and often traveled with a small contingent of bodyguards. For some time, he did not travel in an armored car and he refused to wear a bulletproof vest. Rabin’s longtime political nemesis, Shimon Peres, became prime minister after the assassination. He called an election three months later and was expected to win easily because of sympathy for Rabin and the desire of Israelis to see Peres continue his legacy. Terrorist attacks increased dramatically, however in the weeks just before the election and the public found Netanyahu’s campaign based on security more compelling than Peres’ commitment to the Oslo process and the Likud leader narrowly won the premiership. Today, there is a monument at the site of the assassination on Solomon ibn Gabirol Street between the Tel Aviv City Hall and Gan Ha’ir. The monument is composed of broken rocks, which represent the political earthquake provoked by the assassination. The area where the rally was held was subsequently renamed Rabin Square. A national memorial day for Rabin is set on the date of his death according to the Hebrew calendar (12 Heshvan) and rallies have been held annually in Rabin Square in his memory. Serge Schmemann. Assassination in Israel: The Overview. Rabin Slain After Peace Rally in Tel Aviv, Israeli Gunman Held, Says he Acted Alone, New York Times, (November 5, 1995).